The Martian Embassy has come to Sydney. I have been in awe of Dave Eggers ever since I saw his amazing TED talk (which everyone really should watch) about encouraging writing and creativity in kids behind a store-front that itself captures the imagination. Last year we had the chance to visit the Pirate Supply Store at 826 Valencia in San Francisco and were blown away by the combination of utterly enchanting shop and thoroughly good educational programs. 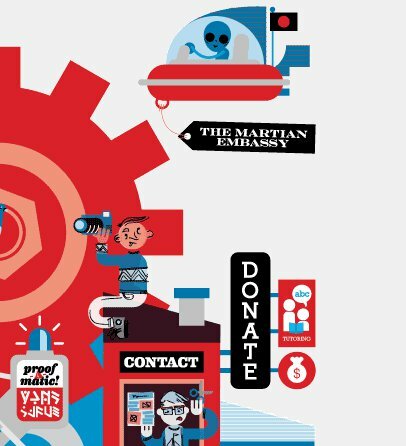 Now Sydney has its own version: The Sydney Story Factory and the Martian Embassy. The Story Factory is a not-for-profit creative writing centre for young people. Trained volunteer tutors offer free help to write stories of all kinds. Programs target marginalised young people, and those from Indigenous and non-English speaking backgrounds, but are open to everyone. The Story Factory’s wonderfully whimsical website delivers some examples of student works and explains why they do what they do. It also provides an opportunity to support this exciting initiative: whether through a donation or by volunteering some time. Their tag-line is “Igniting the spark of creativity in every child, one story at a time.” In this day and age there can be little more important than encouraging creativity and the capacity for children to express themselves. Take a look at their website or visit them at 176 Redfern Street, Redfern and be inspired!